I was a little MIA on the blog last week. Much has transpired! I made a wedding cake! 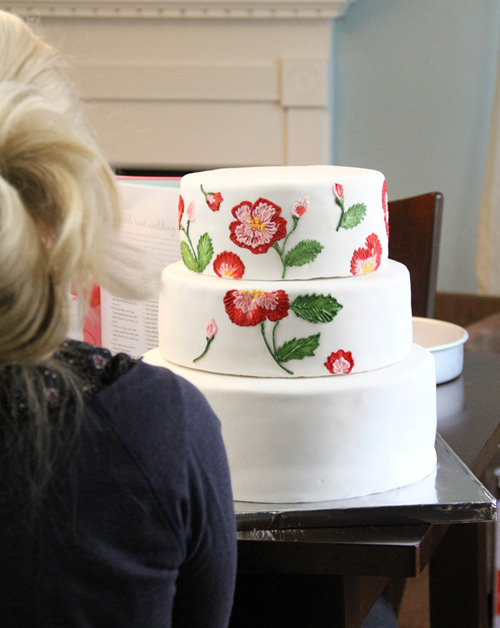 A brush embroidery wedding cake. It was the first time I'd picked up a paintbrush in a very long while. I decided to forgo any kind of template (maybe I'm getting cocky in my old age?) and see if the nearly dormant instinct for brush strokes could be rekindled. It didn't take long for me to get back in the routine. Making this cake reminded me of all the things I love and hate about painting. Love: hours spent alone, the rest of the world disappears. Love: creating something beautiful for someone you love. Hate: that crick in your lower back that comes with spending hours hunched over your work. Love: the lasting memory you're creating. Hate: stained hands, strained eyes. In the end it made me miss creating art on canvas. Maybe I'll have to dust off the ol' easel after all. I made a groom's cake too! 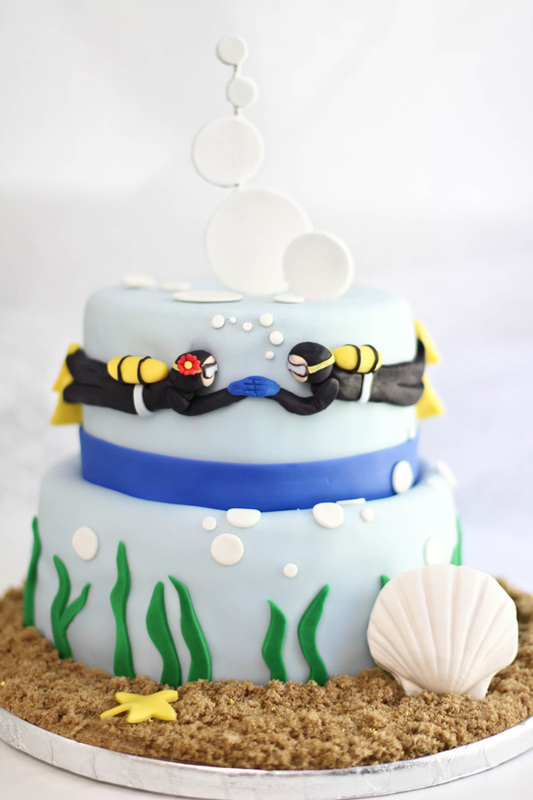 The groom proposed underwater, so this cake is a nod to that occasion. I really enjoyed sculpting the scuba divers, even if they are a little Chagall-esque. I managed to take a few pics when I was off-duty from being Matron of Honor and wedding cake baker. 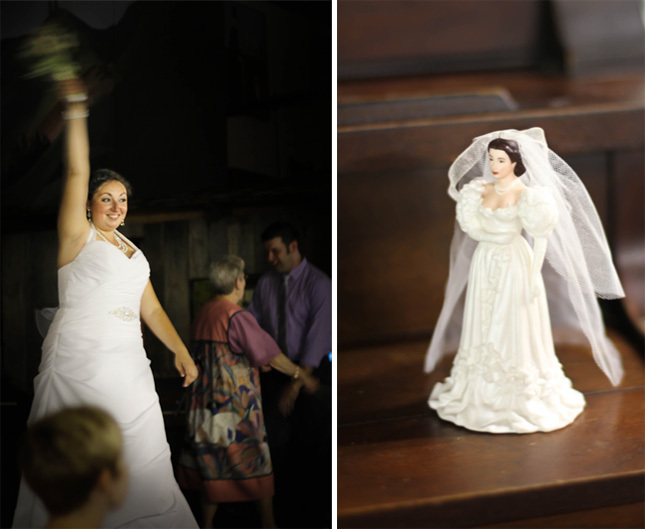 The ceremony was held at the beautiful and historic Museum of Appalachia. The bride found out a week before the wedding that she is gluten intolerant, so I made her a little gluten-free chocolate layer (right). 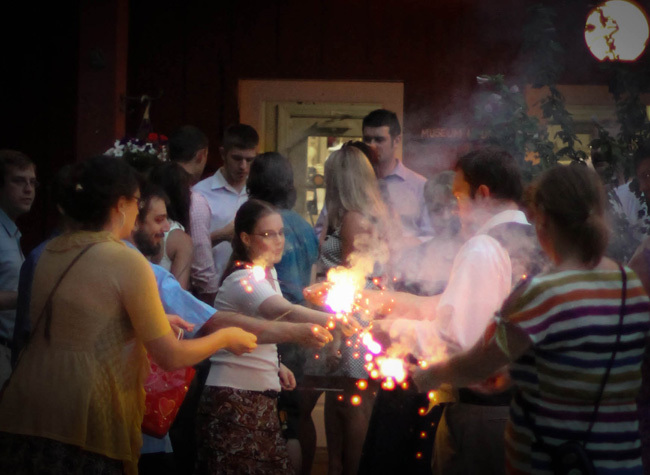 My favorite part of the evening was when everyone came together to light sparklers for the bride and groom's exit. It gave me the warm and fuzzies just like the candlelight service at Christmastime. And the fate of the cake? You can't tell because of the poor lighting, but that's a white cake with lemon curd filling and vanilla bean buttercream. Everyone loved it and there was only a few crumbs left of the chocolate-raspberry groom's cake. Success! I was one happy baker! My apologies for no recipe today. I'll be back to regular posting very soon! Wow. Simply amazing. Once again, I don't know what to say after looking at one of your masterpieces! i saw the photo on instagram and was in LOVE immediately - absolutely gorgeous! Wow, that's amazing! You should definitely go back to painting! Oh great job Heather, both cakes look wonderful and I bet they tasted AMAZING too! I wish I could have you make a wedding cake for me! Maybe for our 15 year anniversary - 3 yrs from now. Seriously...SO gorgeous!!!!! What a pretty cake! The decorations are magnificent. Absolutely stunning! That scuba proposal reenactment cake is too precious! The flowers are beautiful, absolutely stunning! oh my word, that cake is amazing! the flowers are just gorgeous... i love that you incorporated texture into them! I have been waiting for these pictures. Beautiful!!!! Thanks for sharing!!! gorgeous cake :) love all the pictures too. WOW! The cake is stunning! You did an excellent job on both. 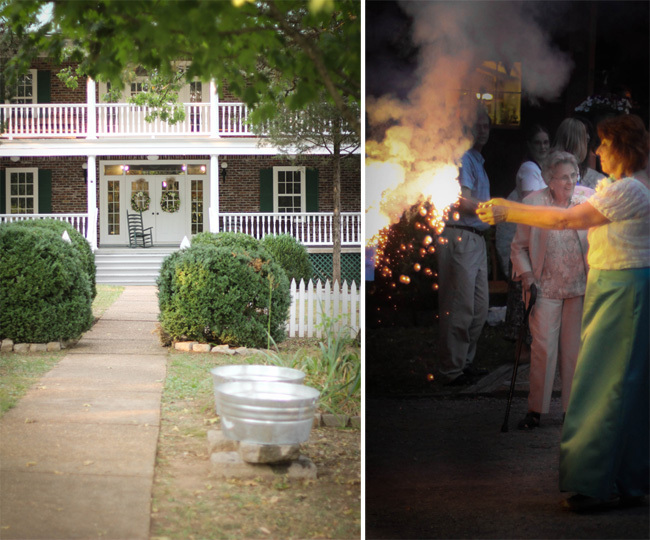 I grew up in Norris and never would have thought of having a wedding at the museum! It looked perfect! Stunning - I know what goes into making a wedding cake - mine have all been "all nighters" and I arrive at the venue looking like death warmed over. I can't imagine having enough energy to fix myself up to be one of the guests, forget about being the Matron of Honor!! Excellent job!! Absolutely gorgeous! You are so talented! How g o r g e o u s is that wedding cake!?!! Gorgeous looking AND tasty is a rare combination in wedding cakes, but from the looks of your cake in the "after" picture, you nailed it! Congratulations, and I hope everyone had a gread time at the wedding! An incredible cake for a beautiful couple! Those pictures say a million words. What a lucky couple to have you baking for there wedding. Love those cakes. Those cakes look incredible! I love the embroidery on the wedding cake, and everything about the groom's cake, especially the bubbles - nice touch. Your divers look great! Congratulations to you and the lucky couple! What a stunning cake! It looks amazing, and even better... it looks like it was delicious too! What a gorgeous cake! I've seen some pretty ones in my day, but this really tops them all! It looks like it was a lovely wedding, and I know it meant a lot to the happy couple that you were a part of it. All three cakes (the original, the groom's, and the mini gluten-free cake)are absolutely stunning. I would be so worried that I would screw something up. 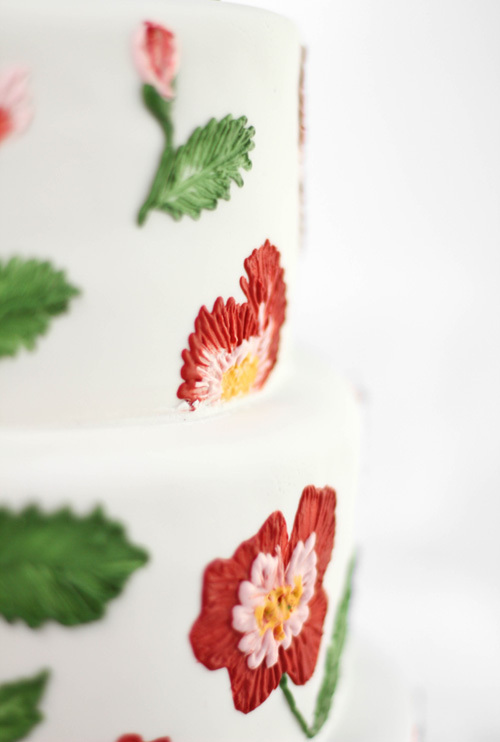 Your cake is a true work of art! Love how much this looks like real embroidery. Beautiful! Wow!! How long did the painting take? It looks AMAZING! The wedding cake is beautiful! The groom's cake made me smile. And the little gluten-free cake just touched my heart. A week out and finding out you are gluten intolerant could mean you would have nothing to eat at the meal you planned! Well done!!!!! What an amazing accomplishment! Great job!! Both wedding and groom's cake are terrific. The embroidery cake is absolutely stunning but you have captured my scuba diving heart with the groom's cake and I think the Chagall-esque divers make it even more special. Amazing, incredible, beautiful... Words don't do justice to this! Wow thanks for sharing ! really great job ! I can't imagine seeing anyone cut into this masterpiece, but after seeing the photo, I want a piece too! Such beautiful work and looks like a lovely wedding too! There are no limits to your talent....just amazing. Both of them....or should I say, all THREE?!? So sweet of you to make a GF version, too! P.S. Hey! 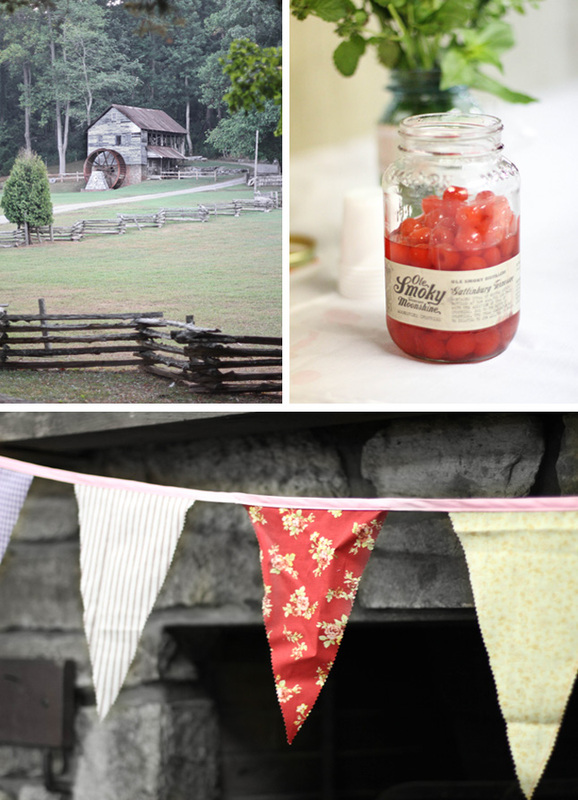 I want a jar of those Smoky Moonshine Cherries, thank you very much! When I watched the reception staff stab my first wedding cake and dismantle and serve it in about 10 seconds flat, I admit I wanted to cry a little. 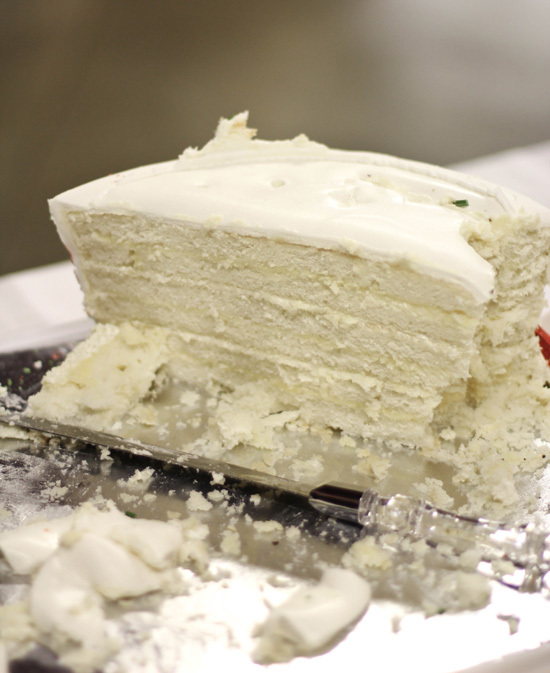 Luckily that feeling goes away when you see everyone enjoying the cake and eating every last little crumbful. 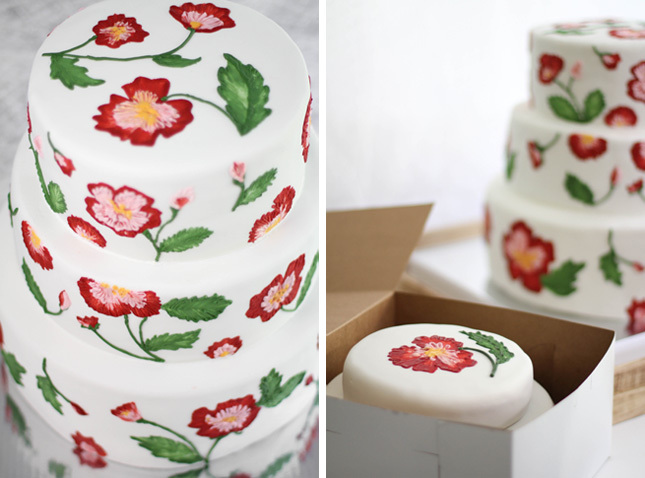 This is a beautiful cake, I haven't ever tried the brush embroidery but this is inspiring! Very, very beautiful and elegant cake! That was such a beautiful cake. You did a great job! I haven't tried that technique, but my interest is sparked. Thanks for posting the photos, and congrats on a successful wedding and groom's cake! I usually just lurk here, but as someone who embroiders I really love this cake. You did a fantastic job and it made my day to read your post. Both cakes are gorgeous! I am amazed at your patience - I would have a difficult time finishing a project as big as a wedding cake. 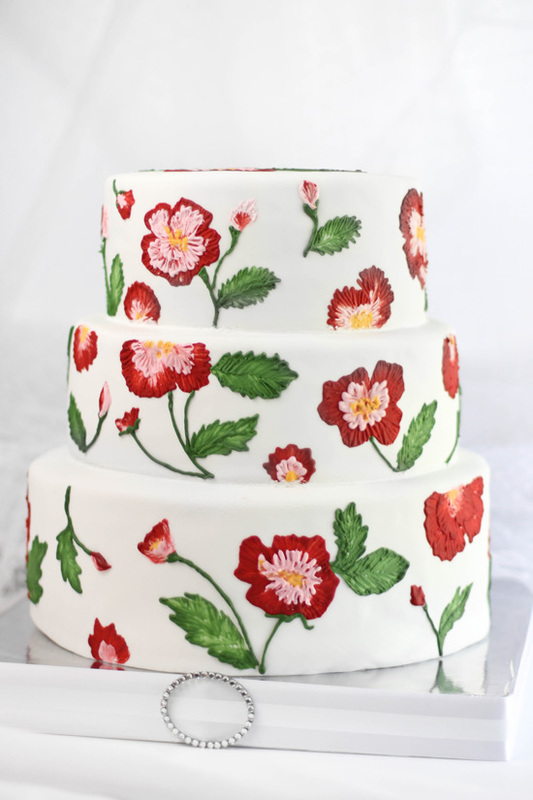 Your design is very pretty and I love how adorable and thoughtful the groom's cake is! I am in awe. What an amazing job you did. 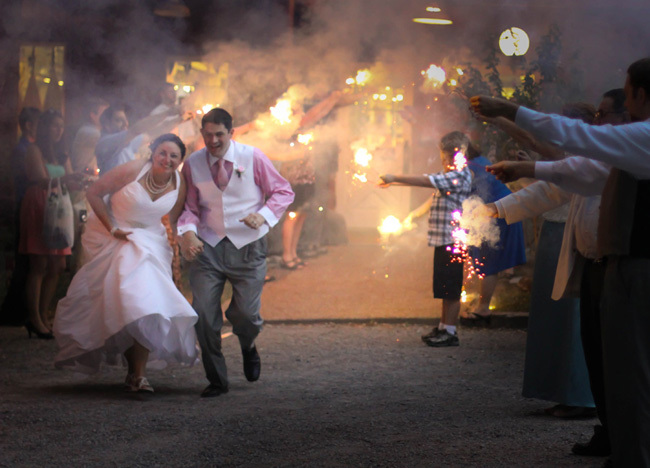 I love the pictures of the reception. Kudos! I have only just found your blog, and wow your cakes are amazing! Looking forward to regularly reading now! This is my first visit to your beautiful blog - what a wonderful experience. I will certainly be back often. How beautiful!! And it sounds delicious too! Such a gorgeous wedding cake! I LOVE the groom's cake too:) Saweeet! Love seeing the picture of the cake having been devoured...best compliment to its artistic creator ever! Love both cakes! I sure have enjoyed your website. I just love the cakes you make! Absolutely beautifully done! Both cakes are exquisitely done. Color, design, balance -- perfect! I can definitely relate to your love/hate relationship with painting and caking. I go through the same rewarding struggle every time I sculpt a cake. oh, it's wonderful your cake!really good job! Couldn't be prettier. Even those of us who did not partake in devouring are no doubt feasting with our eyes...I know I am. Beautiful job! Both are fabulous, but I'm loving the grooms cake! Wow, these cakes are amazing! 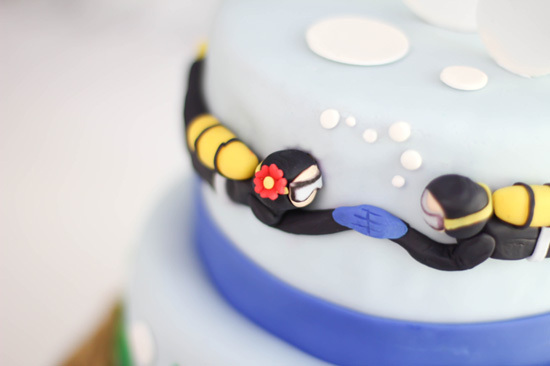 I love the scuba divers on the groom’s wedding cake - Absolutely superb! Absolutely Beautiful. A very talented lady. I would love to do something that lovely. You are very gifted, that Cabbage Rose Cake is beautiful. That wedding is my kind of shindig! Can't get over how you got the brush strokes to look so much like embroidery! Fabulous work! Wow, that wedding cake is incredible. I love the detail and colors. I just found your blog and you are so talented and such an inspiration!!!! That is one of the prettiest wedding cakes I've ever seen. And the wedding looks like a total-hoot-mega-blast!! Absolutely beautiful! It sounds like you had a lot to juggle during the wedding but you were still able to produce such beautiful creations...bravo. Wow ! Love the cake, it was a simple and fun wedding. Simple cake, and I'm sure it taste so good. The wedding cake is breathtaking. This is the most interesting and gorgeous cake I have seen in a long time. Kudos, girl. You're a genius! What an extraordinary cake, I love it . It's so different and beautiful thank you for sharing. 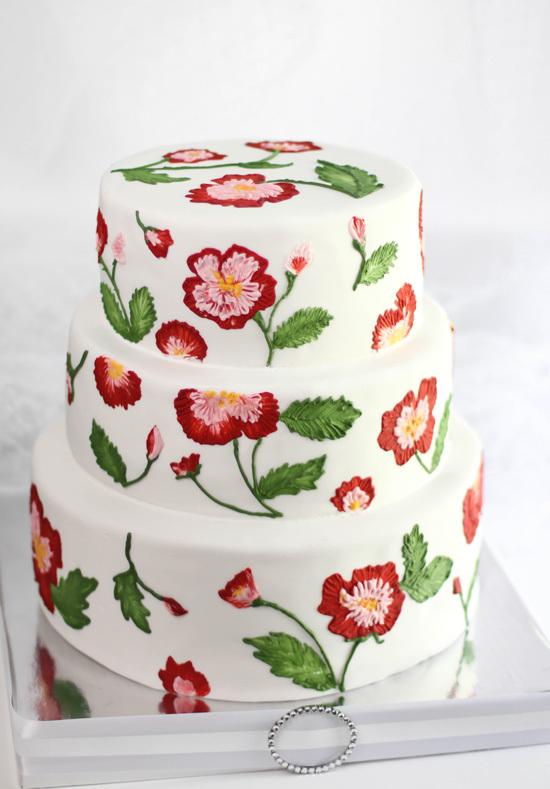 I was wondering.... What did you use to paint the flowers onto the cake? Is it like a Royal Icing or buttercream? Que de talent, à chacune de mes visites mes yeux se remplissent de beautés plus belles les unes des autres, c'est un plaisir de pouvoir venir regarder toutes tes belles créations, félicitation, tes photos sont vraiment très belles, continues ton beau travail, bonne journée. Heather, that is CRAZY!! I've never seen this post. AMAZINGLY gorgeous!!!!!! !